You know this word, non-culinary people? Coz I don't. Haven't heard of it until my teacher uttered the word ba-me-ri in class. I remember my teacher also giving its Spanish translation which sounds something like "ba__maria" (Didn't pick up the second syllable). I was too shy to ask for the spelling so I wrote "bamaria???" in my notebook and made a mental note to google "bamaria" or "bammery" when I get home. Sometimes it pays to read your notes before heading to class. As I run through my copy of the recipes, I found "bain-marie" written many many times. Hohoho! Trimmed and unpolished nails. Socks on. Chef's jacket, apron, cap, white side towel, handouts, notebook, pen and index cards in my bag - all check. Dang, I was late for more than 5 minutes. I got stuck in traffic when I was only a kilometer away from the school. Everyone's already in their uniforms including Chef Vivian. I took one of the empty seats on the first row. I was given time to put on my uniform before the lecture started. I was seated next to Mommy Ging, who I won't be seeing for most of the course because she's in the cooking class and on my right was Jo Anne, our newest classmate in the baking class. Grace was seated next to Mommy Ging so we had the chance to have a mini chit-chat while I was putting on my uniform. 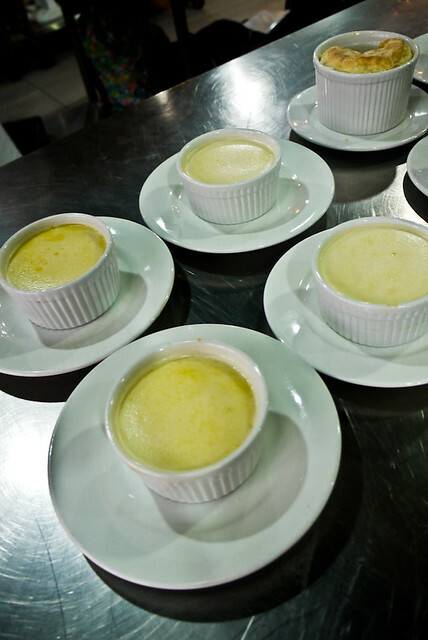 For the first hour and a half, Chef Vivian did a lecture about custard, pudding and soufflés. We then all moved in front into the kitchen counter to get a better view of the demo. 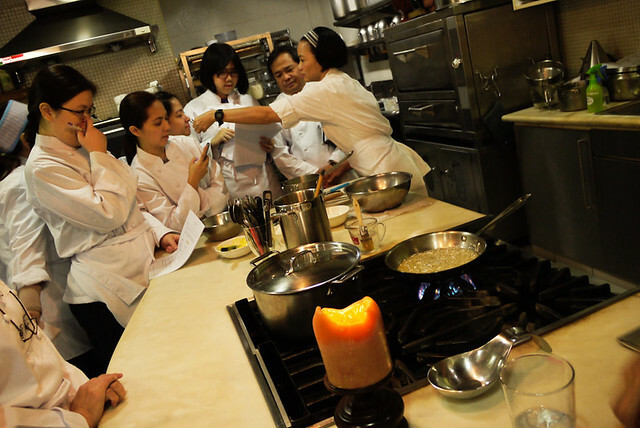 I tried to jot down every important detail that Chef Vivian said during the demo. Terms like "Nappe" and "Alpha-Amylase" were another addition to my culinary vocab. Just before the break, we were divided into 4 groups. Grace and I were both excited we found out we belong to group 4. We also have Dara, our youngest in the class. 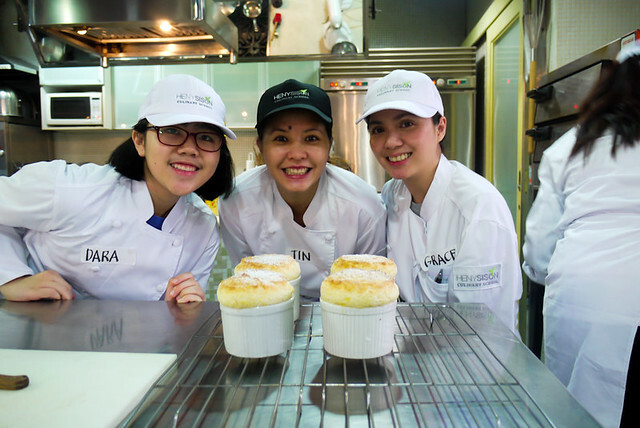 Our group was assigned to do the Vanilla Pot de Crème, Pear Pudding and Cheese Soufflé. 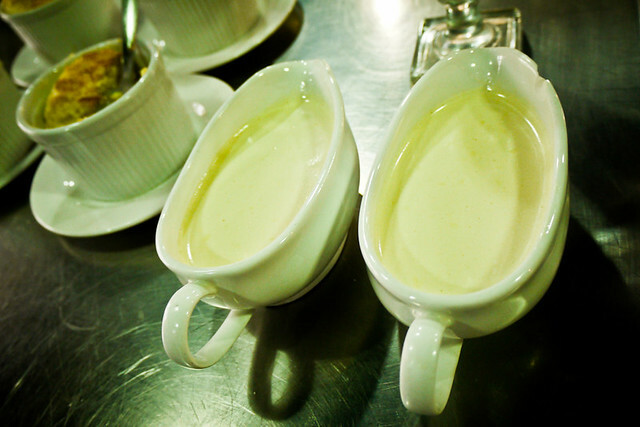 All groups have to do the Crème Anglaise. We were given less than an hour to have our lunch and meet with our groupmates. 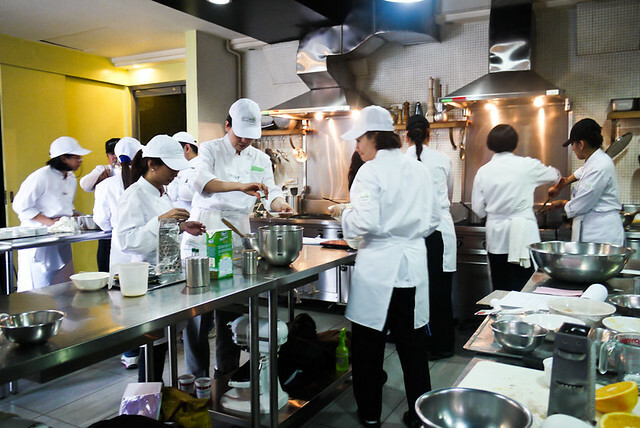 Our group decided to divide the recipes and just assist each other in the preparation. We worked on our cheat sheets first then started preparing our ingredients. Our group was the first one to finish all the work so we had plenty of time to relax while waiting for our baked goods. Grace did 95% of the work here. I almost ruined it when I sprinkled it with powdered sugar. 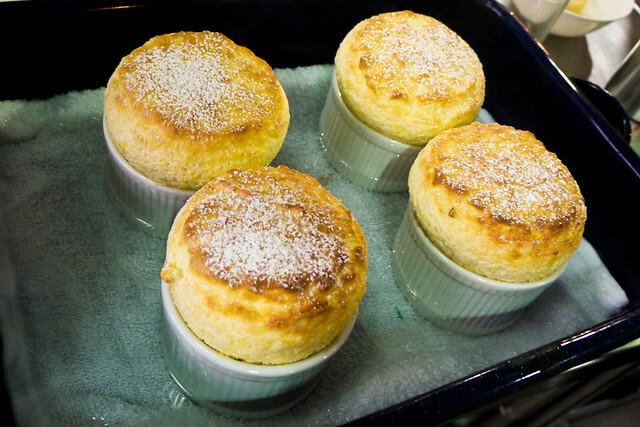 One of the assistants told me to sprinkle on it when he thought it was a lemon souffle. But I'm still partly to blame because I should have presence of mind in the first place. 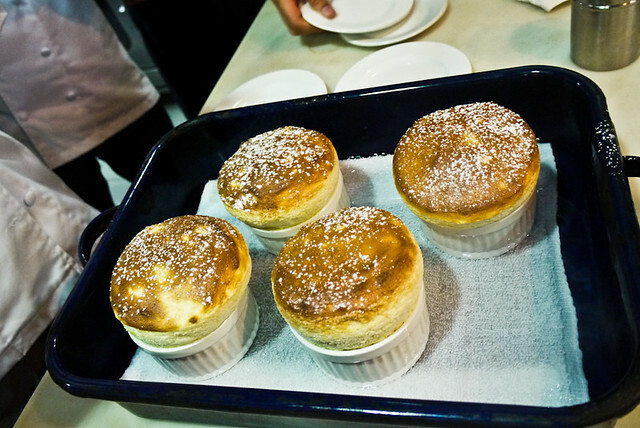 Luckily it was powder base so Chef Vivian just simply blew on the souffle to remove the sugar. photo-op during the evaluation. haha! 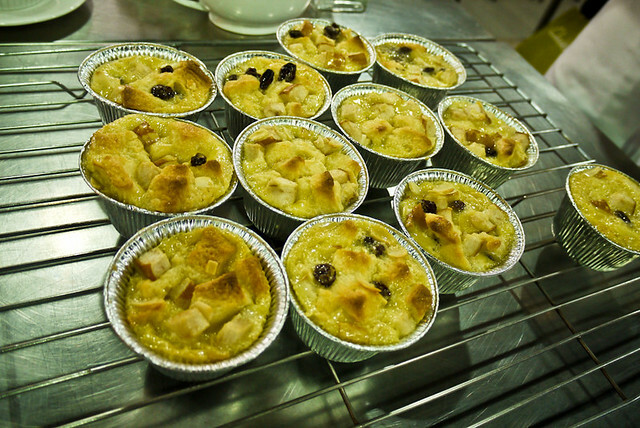 I made this pudding with the help of Dara who prepped the bread and the pears for me. We almost forgot to do this. So while waiting for Dara to finish preparing the bread and pear for the pudding, I prepared all the ingredients for this and Grace did the rest. Our class was extended to 5PM. 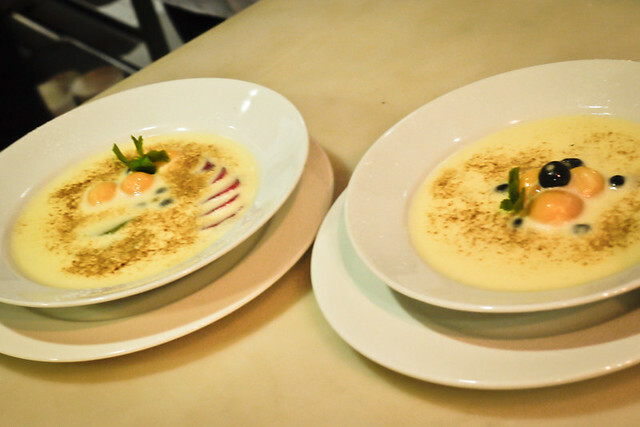 While waiting for the other groups to finish, Chef Vivian called us in front to taste and compare the Pot de Creme and Creme Caramel she demoed earlier. 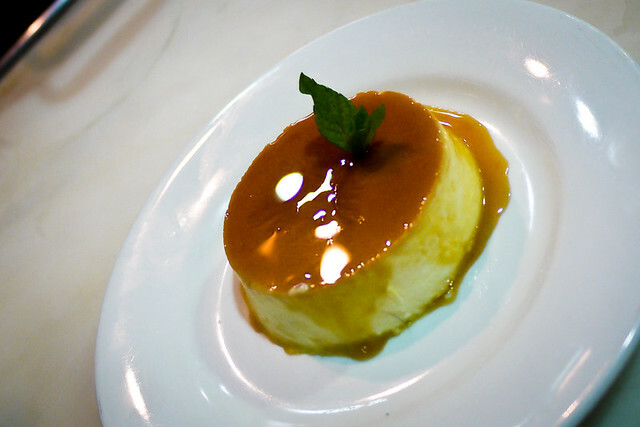 I'm not really a fan of leche flan or creme caramel ever since. 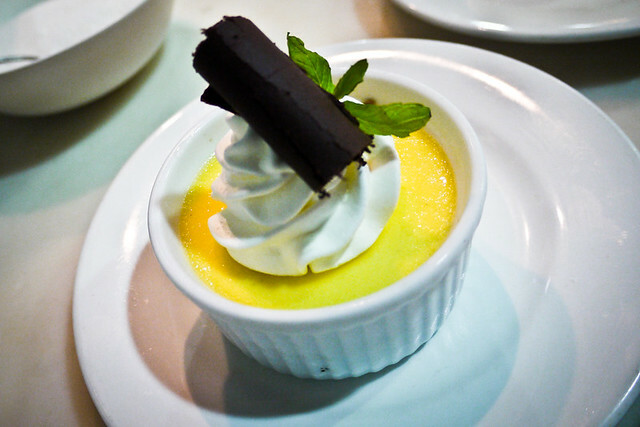 I liked the Pot de Creme better because it's richer and creamier but not good for my diet. Haha! We also got to taste the work of other groups. 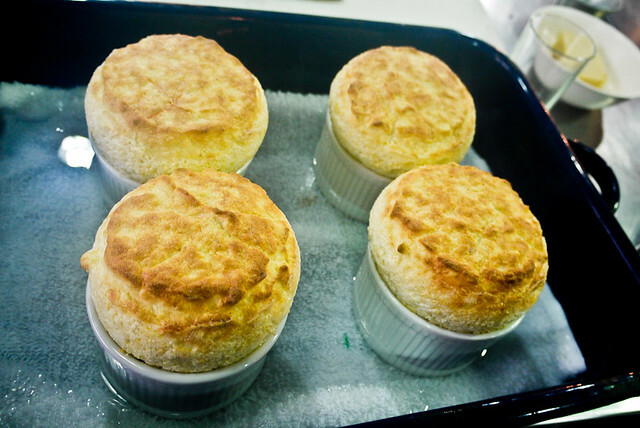 Among the souffles (chocolate, lemon, grand marnier, cheese) I still loved ours.